Hi everyone! I hope you all had a great weekend. We had dance recital this weekend and both my girls did a great job! This week will be a crazy one as the school year winds down and we finish our baseball and softball season. We have six games and two awards ceremonies this week! 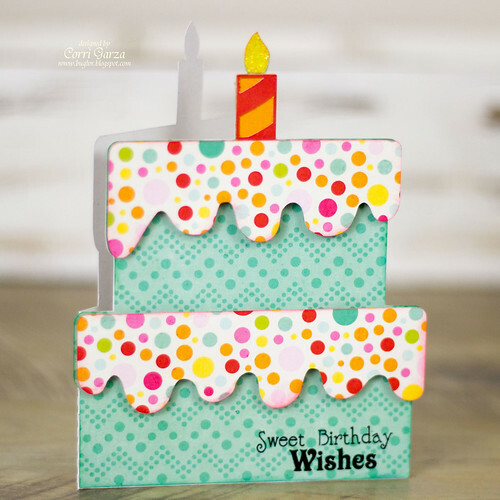 I'm up on the Lori Whitlock blog today with this fun shaped card. I used paper from the Echo Park- Summer Bliss Collection that Lori designed. The colors are so bright and festive! You can find all the new shaped cards in Lori's shop or in the Silhouette Store. Corri, this card is absolutely adorable! LOVE the cake shape!! I saw this and several other links at Food for Thought over at Paper Issues!! Way to go - you are both clever and creative! I love how you created all those adorable food shaped cards!! I am so way impressed!! But then I always am whenever I visit your work! !